2002-3 to examine recommended Shear Zone route (identified in March of '96), establish fixed temporary camp, develop passage for heavy equipment thru Shear Zone, decamp & return to McMurdo. 2003-4 establish route beyond Shear Zone across Ross Ice Shelf, mobile camp, progress to Leverett Glacier as far as possible & return to McMurdo. 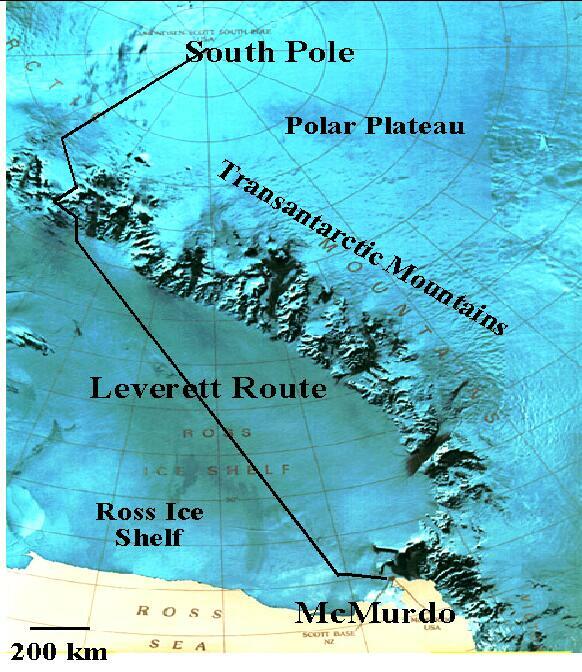 2004-5 traverse established route beyond Shear Zone, across Ross Ice Shelf, up Leverett Glacier, mobile camp, continue route development, execute heavy equipment traverse from Leverett to Pole, deliver cargo, & return to McMurdo. The 2003-04 effort fell short of the goal, experiencing extreme soft snow and tough travel conditions. They turned back 420 miles south of the starting point (Antarctic Sun news article). But the 2004-05 effort has experienced better conditions so far. One scenario for the "production" traverses is a "Fuel Train" configuration of one "tractor" (still to be selected based on the proof-of-concept effort) with 4 support sleds and 4 tractors w/ 2 fuel sleds each. This comprises "one swing" which takes 20 days outbound and 10 days return for a total of 30 days. Assumption is a total of 3 complete swings (15 tractors, 36 sleds) and each swing completes 3 round trips per season (MacTown to Pole) and delivers 203,200 lbs fuel payload per trip or 29,882 gal. So 3 swings, 3 trips each delivers 268,938 gal per season.